This visualization is meant for daily focus. It is also how we will begin the July 25th Major Love Prayer! For more information, partners and a topic focus schedule, please see the article Come Together Over Michael Jackson and the July 25th Facebook Event! When your mind is quiet and your breathing feels natural and comfortable, visualize children in need all across the world receiving food. You may picture them literally being fed (as the child in the image above is holding food), seeing emergency air drops of food and water landing in needy areas, people reaching out to help. Imagine that you and Michael are happily handing out food to them. See them smiling and content. ALL children are fed. ALL children are properly nourished. If it helps you to visualize, watch the video for We Are the World or for Man in the Mirror... see the change that occurs halfway through when the people of the world take steps to help! Pour all the love your heart can hold into the intention of feeding all children on Planet Earth on July 25, 2012. Know that Michael joins his prayers and intentions to ours and that all of God’s universe joins us in our visualization to create peace. Repeat this visualization, if you wish, to anchor it firmly in your awareness. On the repetition, you may want to add your intention that on July 25, 2012 every child will be fed. Feel the joy of that minute of silence and extend that joy and peace outward to blanket the planet. Feel our great love for our beautiful, blue planet and all her inhabitants. I am a memberf of Michael's Circle of Love and I thank you for our welcome. 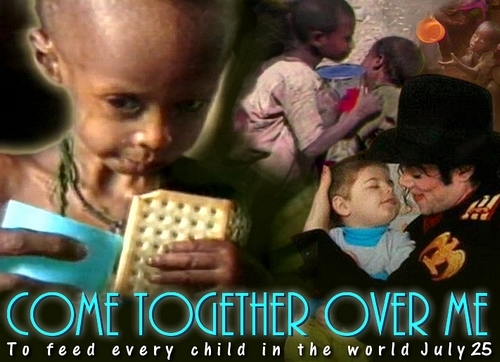 I am very muc h looking forward to joining with you all in this Come Together campaign, for all the children, for all humanity and our beautiful planet in the name of Michael Jackson.